CompTIA Professional Series: This series includes many certifications like CompTIA A+, Linux+ Powered by LPI, Network+, Project+, Security+, Cybersecurity Analyst (CySA), and Server+. CompTIA Specialty Series: Candidates can take specialty certifications in combination with other CompTIA certification exams. It includes certifications such as Cloud Essentials. CompTIA A+ certification is a vendor-neutral certification that validates professionals competence in the areas such as installing, maintaining, customizing, and operating personal computers. You will have to pass two CompTIA exams 220-901 and 220-902 to achieve this certification. CompTIA Network+ certification validates your skills as a qualified networking professional. It is suitable for you if you already have CompTIA A+ certification and at least nine months networking experience. This certification covers managing, maintaining, troubleshooting, operating and configuring basic network infrastructure. CompTIA Security+ certification is an international, vendor-neutral certification. The certification is a proof of person's competency in system security, network infrastructure, cryptography, assessments, and audits. This certification is designed for IT professionals who already have Network+ certification and two years of technical networking experience, with an emphasis on security. CompTIA Advanced Security Practitioner (CASP) certification validates IT professionals with advanced-level security skills and knowledge. This certification covers enterprise security, risk management, research and analysis, and integration of computing, communications, and business disciplines. You must have 10 years experience in IT administration, including at least 5 years of hands-on technical security experience before moving towards this certification. CompTIA Cloud Essentials certification validates the candidate's knowledge about cloud computing from business and technical perspective. You must have at least six months working experience in an environment that markets or relies on IT-related services before taking this certification. CompTIA Linux+ Powered by LPI is a vendor-neutral certification that validates the fundamental knowledge and skills required for junior Linux administrators. You must have CompTIA A+, CompTIA Network+ certification and at least 12 months of Linux administration experience before moving towards this certification. CompTIA Project+ certification is an international, vendor-neutral certification that covers the entire project life cycle from initiation and planning through execution, acceptance, support and closure. CompTIA highly recommends that the candidates have one year of managing, directing, or participating in small- to medium-scale project work experience. CompTIA Server+ certification validates the knowledge of candidate in server issues and technology, including disaster recovery. CompTIA's Server certification focuses on advanced network hardware such as SCSI, RAID, SANS, and multiple CPUs. It is recommended by CompTIA that you should have CompTIA A+ certification before taking Server+ certification. 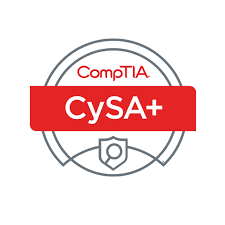 CompTIA CSA+ has now changed to CySA+. CompTIA Cybersecurity Analyst (CySA+) is an international, vendor-neutral cybersecurity certification that applies behavioral analytics to improve the overall state of IT security. CompTIA Cybersecurity Analyst (CySA+) validates critical knowledge and skills that are required to prevent, detect and combat cybersecurity threats.